R G Carter is experienced in the retail sector, and in particular working in restrictive environments. 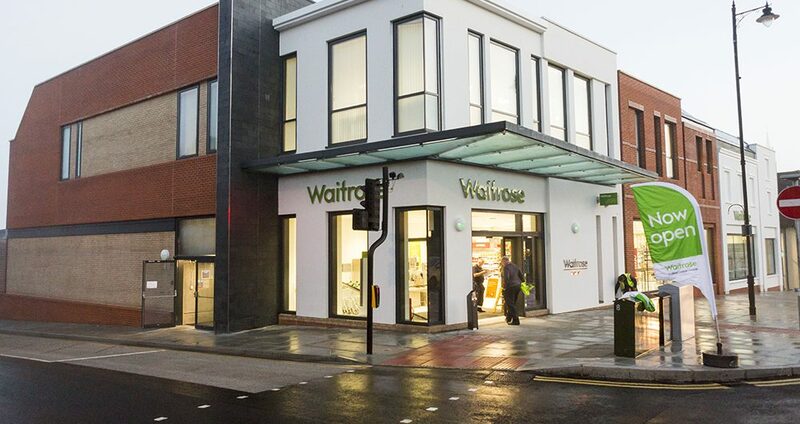 This project example involved the demolition of the existing Waitrose high street branch in Dorking, office block, bookshop and community centre, to make way for a five split-level car park dug into the ground, with the new two-storey branch above street level. Abutting the original Waitrose is a Grade II listed timber frame public house that was to remain unaffected by the works at all times. Alternative groundwork solutions with the possibility of involving another lower deck to reduce footprint were considered, whilst also looking at system built superstructure solutions to simplify construction methods in order to get watertight as soon as possible. The new branch now provides an extended sales floor with new facilities and warehousing on the upper level, including the basement car park over five split levels, providing 201 spaces. Due to the location of the site and the adjacent listed building, careful consideration was given to key enabling and demolition works including the excavation and off site delivery for replanting of a Mulberry tree. Our in-house design team, Carter Design, contributed extensively to the project; initially reviewing the original design prepared by the original design team and raising a number of headline issues that had either not been addressed or required further development. Carter Design developed value engineering proposals reducing costs and risks including; rationalisation of steelwork/ decking design, redesign of subterranean car parking layout increasing distances to boundaries and utilising battered excavations in lieu of contiguous walling. From the basic value engineering solutions prepared, alternative proposals enabling predicted cost savings to be substantiated. The project achieved a BREEAM rating of ‘Very Good’ and was presented with a National Silver Considerate Constructors Award.